One of the more unusual invitations I’ve received in recent weeks was an email asking me if I would like to sample the delights of Gousto. Gousto is a London-based company, which supplies perfectly proportioned ingredients to produce a range of recipes in your own home. Many of us love to cook, but lead busy lifestyles and find that it’s all too difficult to find the time needed to research recipes, shop for good quality ingredients and then spend precious hours of an evening constructing complex meals. As regular readers will know, my blog generally focuses on restaurant reviews – but when we’re not dining out (which, admittedly, we do an awful lot!) I cook from scratch for myself and Mr W every night. When you factor in working, plus visits to the gym and a social life as well, though, it’s easy to become stuck in a rut with a handful of ‘failsafe’ recipes that you know can be knocked up quickly and without the need to constantly buy new ingredients that get used once and then languish in the back of the cupboard for ever more, or – in the case of fresh herbs – wilt and die before they can be fully used. Gousto could be the antidote to all these problems! It’s a subscription service (although you can stop your subscription at any time) and you either subscribe to a couples’ bag, which serves two, or a family bag, which serves four to five people. 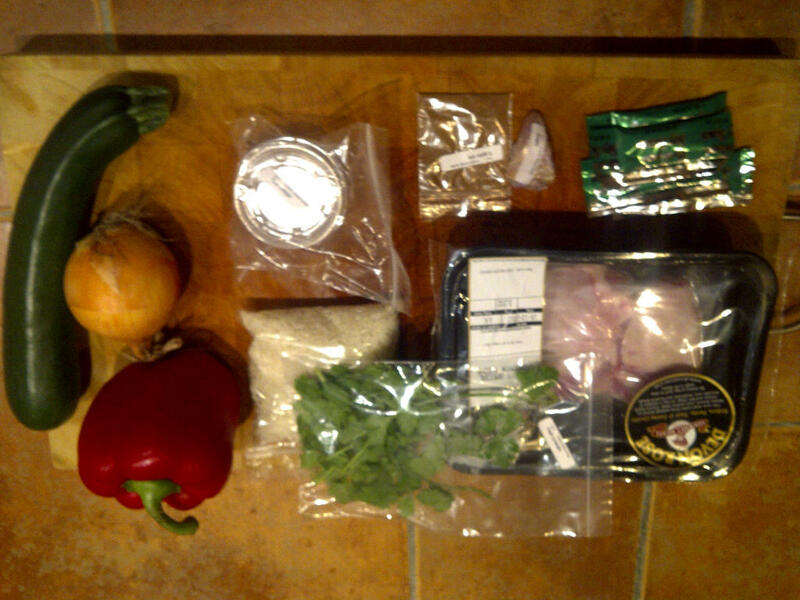 Each bag contains ingredients for three meals, and you go on to the website and choose your meals each week from a wide selection covering different cuisines (the selection changes weekly), which features a generous proportion of vegetarian options and rates each dish according to difficulty and how long it takes to prepare. In London, deliveries are every Tuesday, and in the rest of the UK, every Wednesday. If you’re not at home to accept your delivery, you can leave instructions of where to leave it, and the packaging (an insulated box with ice packs) ensures that the produce will stay fresh until you get home. We tried the couples’ bag, which normally costs £42 for three meals, or £39 if you choose vegetarian options. Our trial bag just had two meals, and we chose a Chinese chicken stir-fry and a prawn linguine with tomato and mustard sauce. 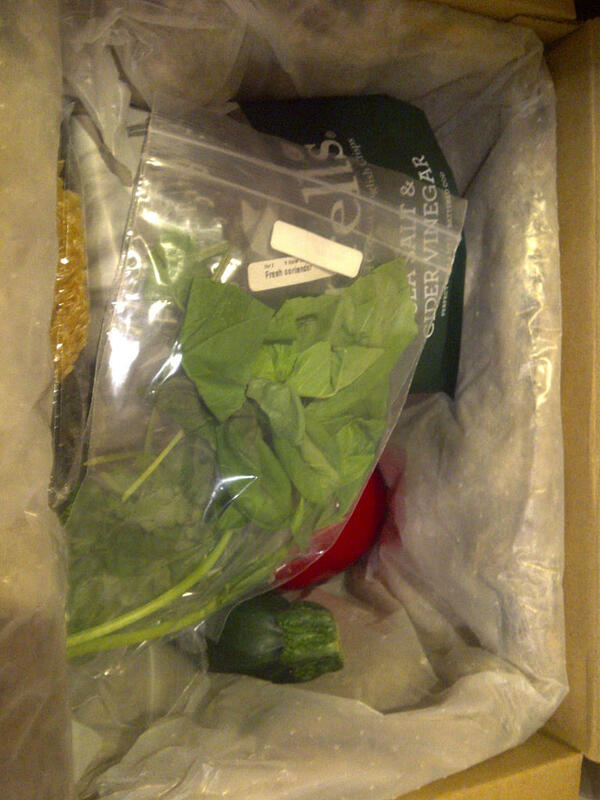 Opening the delivery box was very exciting, with all sorts of goodies to discover (we had a mysterious free bag of crisps in addition to the ingredients), along with illustrated recipe cards introducing the dish, with step by step instructions on how to prepare them. The cards could be filed and re-used, as they list the required ingredients, so if you particularly enjoyed one of the dishes you could recreate it yourself. They also included information on any special equipment needed and any additional ‘store cupboard’ ingredients required (such as sugar, seasoning, oil etc). The quality of the produce appeared to be excellent – fresh, free range meat, beautiful organic vegetables and crème fraiche (Rachel’s Organic – which is one of my favourite brands), healthy looking fresh herbs and expertly packaged portions of more unusual ingredients, such as a tiny tub of rice wine vinegar (which I got excited about because it was cute) and a tightly cling-filmed piece of ginger. Sadly, one ingredient (Dijon mustard) was missing from my order, but thankfully I had some in the cupboard – it would have been disappointing otherwise. Both of the dishes were very easy to prepare, although I found that in places information was lacking – for example, the prawn dish simply said ‘peel the prawns’ without any detail of how to do so, which may have been daunting for a novice cook, and is not a technique I’d expect to be included within an ‘easy’ recipe – at least not without some more detailed instructions. I also de-veined the prawns before cooking them, which wasn’t mentioned at all in the recipe. Similarly, when the recipe called for the cook to coarsely chop the tomatoes, it mentioned nothing about peeling them – I decided to do so anyway, as I knew the dish would be a lot nicer for it! 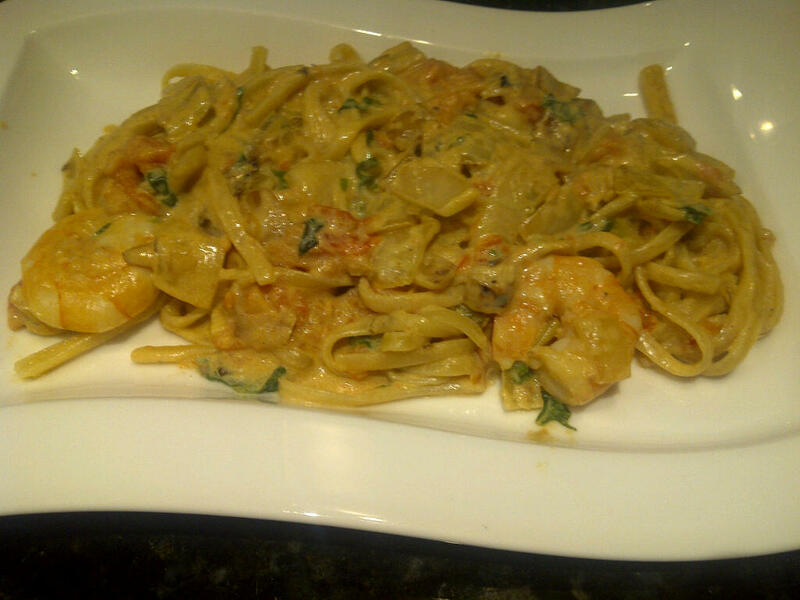 Taste wise, we really enjoyed the prawn linguine. The combination of mustard, tomato and crème fraiche in the sauce is not one I would have thought to try, but it worked well and is something I’ll try again. The chicken dish, however, was disappointingly bland – which was a shame. 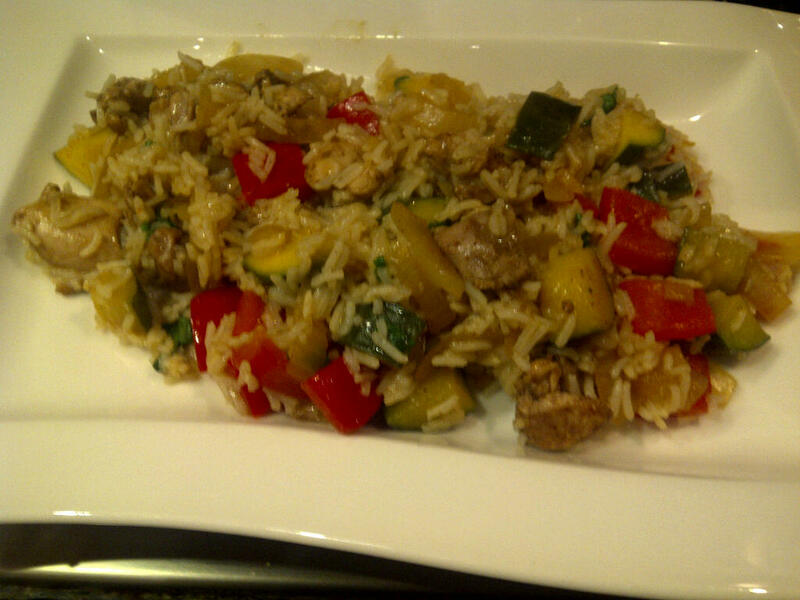 This was the dish that had more unusual ingredients in it, which I wouldn’t have necessarily had in stock. As I felt that the whole point of this system was to be able to cook dishes that used a whole range of different spices, seasoning and ingredients, without having to buy a cupboard’s worth of stuff, I expected a tastier result. I can definitely see a market for Gousto, and indeed they’ve been tried, tested and recommended by some big names, including Cosmopolitan, Woman and Home and the Sunday Times. For me, personally, although it was exciting receiving my ingredients and nice to try a couple of recipes I wouldn’t necessarily have considered before, it took away some of the enjoyment I get from planning recipes and creating my own dishes – and I’ve become quite proficient at planning weekly menus that use ingredients in more than one dish so as to avoid waste but at the same time avoid repetition. If, however, you like to cook, but don’t enjoy shopping and you enjoy following recipes to the letter, I can imagine you’d really enjoy Gousto, although the fact that you can only order three meals a week (presumably due to the freshness of the food) means you’d still have to plan meals and shop for the other four days (possibly therefore having more waste or more repetition on these days than you would otherwise). £14 per meal for two people seems expensive compared with what I could produce on that budget if I shopped for it myself, but if you really value the convenience and not having an excess of ingredients left over, then the cost wouldn’t necessarily be prohibitive. The only other issue I can see with the service is that by definition, people with the busy lifestyle that it is aimed at are unlikely to be at home during the day to accept the delivery. Although you can leave detailed instructions for where the goods should be left, it does mean that you’re restricted if you don’t have anywhere safe and secure for this purpose. One big plus point is that I can see it being a great introduction to home cooking for people who maybe don’t have the confidence to try recipes without a helping hand, and with the food all being so fresh and healthy, it’s an excellent way to ensure that a busy lifestyle doesn’t get in the way of eating well. 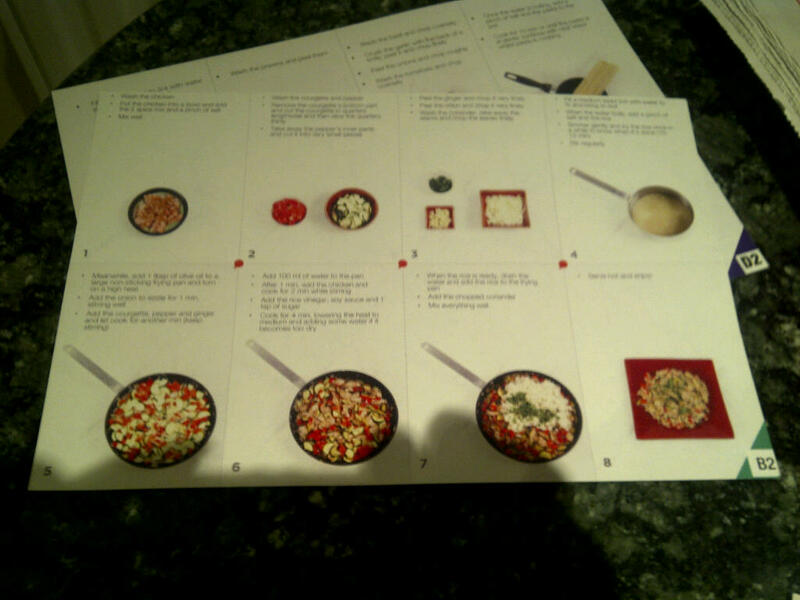 Thank you to Gousto for providing me with a free sample of their service.